Just a quick post this evening as I try to figure out the grocery list for the week. Once again this week I am trying to work on some of the food we have in the freezer and refrigerator. One item I need to get out of the freezer is part of a box of Sandwich Petals. I ordered two boxes of them back when they had their Buy One, Get One deal and I couldn’t eat them quick enough so I put the second box in the freezer. I hope they are still good. I couldn’t decide whether I wanted to make enchiladas or quesadillas with them… But I think in honor of not turning the oven on, I will be making quesadillas. I also have a lot of leftover shredded cheese from making pizza. 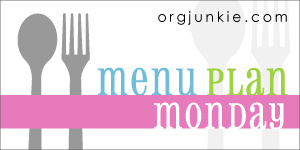 This menu plan is posted over at Org Junkie on Meal Plan Monday – be sure to check it out for other ideas.